It’s been a long time since I can say I saw a movie that was a home run, and I’m incredibly glad the drought is finally over. 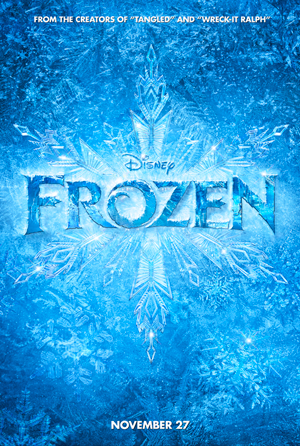 “Frozen”, the latest product of Walt Disney Animation, is a delightful musical loosely inspired by Hans Christian Andersen’s story, “The Snow Queen”. The movie opens with ice choppers singing as they hack away at a frozen fjord, while a young boy (Kristoff) does his best to handle pint-sized tongs and his pet reindeer, Sven. In the nearby castle, two young princesses – elder sister Elsa and younger sister Anna – awake in the middle of the night for some mischief. Elsa has the power to create ice and snow at a touch, and the two young girls frolic in the interior winter wonderland. But as the play gets slightly out of hand, Anna is accidentally sideswiped in the head by a touch of ice from Elsa, and their parents (the King and Queen of Arendelle) take Anna to rock trolls to extract the ice before it freezes her forever. The head troll, Pabbie (voiced by the stoic Ciarán Hinds of “Rome” and “Game of Thrones”), does as they bid, but he warns the King and Queen that he had to remove all of Anna’s memories of magic, and he further cautions them to hide away all evidence of magic. 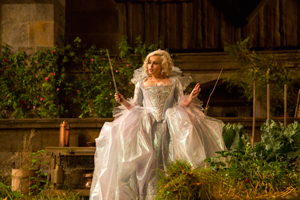 The King counsels Elsa privately: “Conceal it. Don’t feel it. Don’t let it show.” From that point forth, the family is effectively in isolation; they close the window coverings and the castle gates, and the girls are separated for reasons Anna will only learn far later. As the girls grow, Elsa becomes increasingly cold and sad, and Anna becomes eccentric, missing the company of her beloved sibling. Tragedy strikes yet again a few years later, as the King and Queen are lost at sea in a storm, and the girls have to wait in their confinements for enough time to pass before Elsa is due for her coronation as the queen. The young queen-to-be (voiced by Idina Menzel, a Tony Award winner for “Wicked”) fears accidentally putting her power on display, since her forced isolation and her father’s instructions to hide her gift left her with no practice on how to properly control her chilly creations. 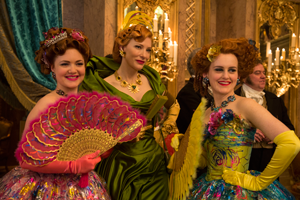 Meanwhile, the boisterous Anna (Kristen Bell – of “Burlesque” and the forthcoming “Veronica Mars” movie) explores the town in eager anticipation of the coronation festivities and all the excitement they’ll bring. 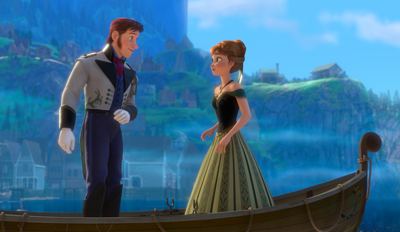 In her enthusiasm, Anna bumps into Prince Hans (Santino Fontana of “The Importance of Being Earnest”), in a meet-cute involving a horse, a rowboat, and the end of a dock on the fjord. He later sweeps her off her feet during the evening’s amusements, but his whirlwind marriage proposal to Anna is quickly dismissed by the new queen. When Anna challenges Elsa over her decision, emotions flare out of control and Elsa’s powers are revealed to a wide audience, splaying ice spikes and frozen coverings in every direction. 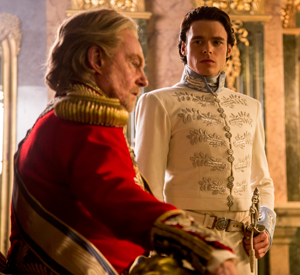 Elsa flees, and a distraught Anna heads out after her – leaving Hans in charge. As Elsa arrives in the cold mountains, she finally takes the reins off her powers and creates a beautiful castle of ice atop North Mountain, the tallest of the peaks. She casts off every bit of evidence of her prior life, and settles into a blissful exile in her cold fortress. Anna finds herself unable to negotiate the snowy environs on her own, so she enlists the help of Kristoff (Jonathan Groff from “Glee”) and Sven. On their way to Elsa’s new seat of power, Anna and Kristoff bump into an old friend of Anna’s and Elsa’s: Olaf the snowman (voiced by Josh Gad of “1600 Penn” and “Ice Age: Continental Drift”). He is based on the same design Elsa had made for Anna on that fateful night when they were children, and the icy queen’s awakened powers have somehow brought him to life. He tags along, a physical comedian of the highest order. Being blissfully unaware of the limitations of a snowman, he sings a giddy tune about how much he’d love to see summertime that leaves the audience giggling over his naïveté. The quartet manages to reach Elsa’s castle, but she’s in no mood to return to Arendelle with Anna, even upon hearing that she has frozen the town in the middle of the summer. She simply doesn’t have the ability or understanding of how to control her powers. The sisters quarrel again, this time with Elsa accidentally throwing a spike of her ice into Anna’s heart. The effect is insidious: Anna is mortally wounded but doesn’t yet realize it. Only after the foursome have escaped the castle do they realize something is horribly wrong, and Kristoff takes the princess to his friends – the same band of rock trolls – to be healed. Only an act of the truest love will save her and warm her heart again, and Kristoff rushes Anna back to Arendelle in the hope that she will find there what she needs to heal the wound to her heart. The climax of “Frozen” seals it an excellent addition to the growing catalogue of Disney movies featuring women who come by their strength on their own, rather than only through the love of a man. The songs are crisp and effective, and small details in them show the excessive (and occasionally modern) humor threaded throughout this movie. Additionally, Walt Disney Animation Studios’ technology and artistry are clearly improving by leaps and bounds; Sven’s fur and the texture on the snowflakes exemplify the lessening distance between Disney’s internal animation studio and Disney-owned Pixar. “Frozen” is either a movie for kids that grown ups would enjoy or it’s a movie for grown ups that kids would enjoy. Either way, it’s really a fantastic effort from Team Disney. The songs, written by the husband-and-wife team of Robert Lopez (“The Book of Mormon”) and Kristen Anderson-Lopez (“Winnie the Pooh”), are sure to have the kids clamoring for the motion picture soundtrack in no time. I would be remiss if I didn’t talk a bit about the 3D used in the movie. In some films, when I see the 3D version, I end up shrugging about how it’s okay but it didn’t really need the 3D or it didn’t lose much if you watched it in 2D. This is a movie that really begs to be seen in 3D, and it’s the first case in a long time – perhaps since I saw “Avatar” – when 3D was used properly. Sure, there are a couple of early cases where the 3D leaps off the screen in almost gratuitous fashion, but that’s some of the joy in playing with this technology. Why should all the depth only be leading away from you? If it’s possible to see this one in 3D, I strongly recommend doing so. There are a couple of scary scenes – but they’re really brief and things move on immediately. For a movie that runs 1hr 48mins long, you’d think it would drag for the kiddos, but the constant nature of the action and the storyline keeps things moving apace from start to finish. The opening credits are a thing of beauty unto themselves, so moviegoers should be in their seats on-time, and they should stay put through the end credits – to catch a small extra scene at the very end of the credit roll. “Frozen” is also preceded by a lovely short film, “Get a Horse”, a marvel of 3D animation that should win an Oscar on technical merit alone. The short showcases Mickey and Minnie Mouse in both 2D and 3D, literally giving a chase scene all new dimensions. I’m sure Walt Disney would be weeping tears of joy if he saw it, since both pieces together really show just how far his team’s animation has come. 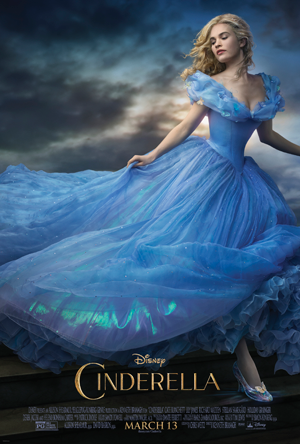 “Frozen 3D” opens nationwide on November 27, 2013. This movie is rated PG for some action and mild rude humor.